Captain James Jackson is a native of Birmingham, Alabama where he graduated from Shades Valley High school. He is a proud Veteran of the United States Marine Corp. He obtained a Bachelor of Science degree in Criminal Justice from Oakland City University. 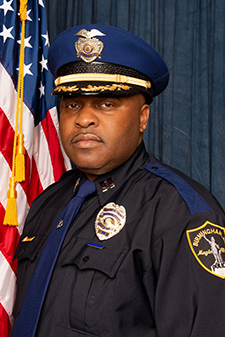 Jackson has served with the Birmingham Police Department for over 25 years. In 1993 he began his career at the East Precinct as a patrolman. He was quickly commended for his work in the community and was named Unsung Hero by the Birmingham News for his work with at-risk, inner-city youths. He continued his career as a School Resource Officer and Weed & Weed Narcotics officer, before he rose to the rank of Sergeant of the Domestic Violence Unit in 2002. He has received numerous commendations and awards from several agencies for his work with victims of violence and sexual assault to include the Verizon Wireless Hopeline Hero Award and the US Attorney’s Award. Jackson was instrumental in the Supervised-Visitation Program with the YWCA which allows victims/non-custodial parents to meet at a safe location for visitation and exchanges. He was also a major advocate in bringing the Family Justice Center to the City of Birmingham, which allows victims to receive all services necessary involved in a criminal incident at one location. He is the first Birmingham Police Officer to have an annual award named after him, “The James Jackson Advocacy Award”, which he can give annually to any non-profit organization of his choice by Verizon Wireless. In 2012, he was also named as one of the 50 most influential Men in Birmingham. From there, he rose to Lieutenant in 2013, where he was assigned to the West Precinct. Throughout the years he has been responsible for numerous initiatives within the department including implementing policies and procedures, operations, and several trainings throughout the United States. Recently Jackson was recognized in 2018 by the Birmingham News, AL.COM for his KAA Magazine mentorship with troubled teens. Jackson holds many certificates in law enforcement and is a certified instructor with FLETC and the State of Alabama. Jackson was promoted to Captain in 2018 and is currently assigned to the North Precinct as Commander which is where he presently serves. He is committed to putting people first. He believes where there is ignorance of God, crime runs wild. Most importantly, Captain James Jackson is a man of Faith.